Former Seahawks cornerback Richard Sherman said Thursday in an interview on UNINTERRUPTED that the Seahawks are "really being curious'' about their younger players, leading to the shedding of some of the team's veterans. So what is the Seahawks’ grand plan this offseason as they embark on the biggest purge of their veteran core during the Pete Carroll/John Schneider era? One veteran shown the door — cornerback Richard Sherman — thinks he knows. During an interview Thursday on UNINTERRUPTED’s The ThomaHawk Show featuring former Cleveland Browns Joe Thomas and Andrew Hawkins, Sherman offered a few theories. Carroll, Sherman said, is going back to his roots as a college coach, where heavy roster turnover and building a new team every few years is the norm. Sherman, who late in the 2016 season talked dismissively of Carroll having a “kumbaya’’ meeting, said Carroll may feel the veterans have already heard everything he has to say and might want to embrace the challenge of building anew. “We had literally heard them all,’’ Sherman said of what he called “every story, every kind of funny anecdote that he had. Sherman said he thinks the Seahawks feel they can find younger players who can play as effectively as the veterans they are shedding. Polamalu was a starting safety for the Steelers until he was 33. “I think they’ve kind of lost their way a little bit in terms of how they see players and how they evaluate players,’’ Sherman said. But during the interview Sherman said he didn’t sign with the 49ers to stick it to the Seahawks. He said it was because they were the first team to pursue him and pursued him the hardest and that he wanted to stay on the West Coast. “They were the first team that called, the team that showed the most interest, offered the most money,’’ he said. And he repeated again that he called Schneider, the Seahawks’ general manager, and asked if they wanted to match the 49ers’ offer and keep him. Sherman implied that the Seahawks expected after they released him that he would draw little interest and might have no choice but to come back to Seattle. Sherman signed a three-year contract with the 49ers that is incentive laden and could earn him up to $39 million, but it also fully guaranteed him just $3 million. But Sherman noted that if he is recovers from his Achilles injury and plays the full season he would get $10 million. “I trust in myself and my ability to heal and rehab and grind, and I wanted to be protected in case I do return to form,’’ he said. What Sherman said was not a factor in his departure was any locker-room friction. An ESPN story last offseason painted a picture of Sherman and the defense feeling as if quarterback Russell Wilson was treated with kid gloves by coaches and that there was a tense dynamic between the defense and offense. What Sherman didn’t dismiss is that Carroll’s coaching future could well be determined by how this offseason makeover pans out in the fall — Carroll will be 67 in September and has two years remaining on his contract. 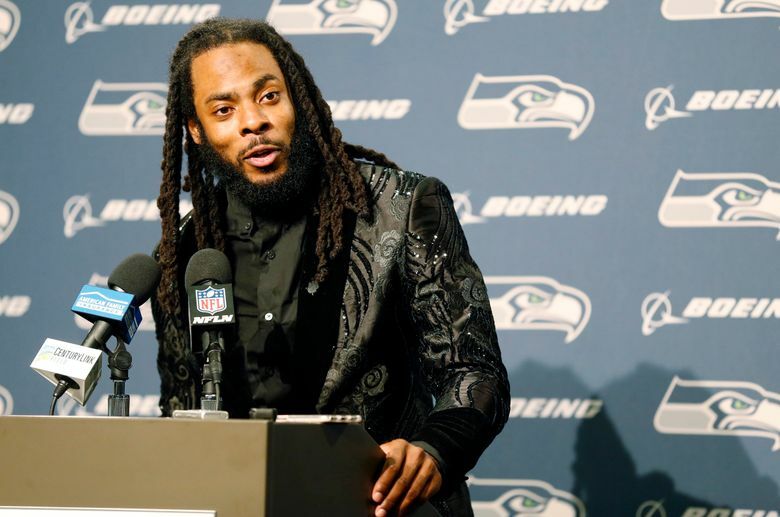 “If things don’t go as planned and they don’t get to the playoffs and they have a rough year I think that will weigh into his decision,’’ Sherman said.